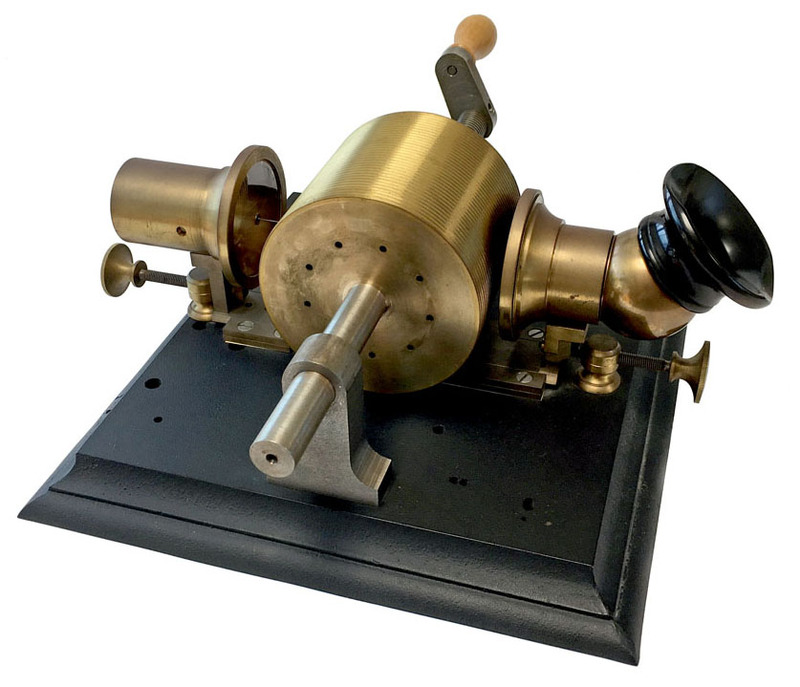 The extreme rarity of original tinfoil phonographs makes it exceedingly difficult for collectors to enjoy examples of these historic machines. 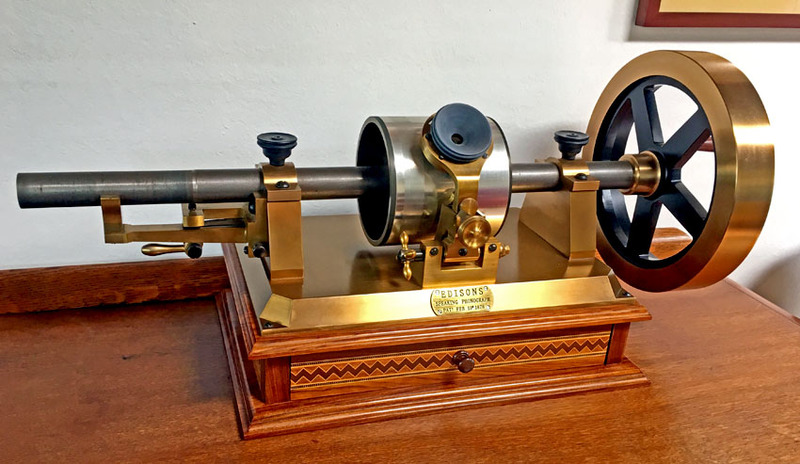 However, several very high quality replica phonographs have been made over the years, bringing otherwise unobtainable machines into the reach of those who are intrigued by the astonishingly simple yet effective technology found in these relics of 1877-1880. The replicas below are extremely precise copies of two ultra-rare original Edison phonographs, and are capable of functioning exactly as their museum counterparts. Edison's first phonograph was hand-built in the Menlo Park laboratory by his assistant, John Kruesi, between December 2-6, 1877. Amazingly, it worked the very first time, repeating Edison's "Mary had a little lamb" clearly. Tinfoil was wrapped around a grooved brass mandrel which was hand-cranked. As the recording diaphragm vibrated the foil was indented by the stylus. In playback these vibrations were traced by the playback diaphragm, reproducing the sound. Recordings cannot be replaced after removal from the mandrel, and tinfoil recordings wear out after only a few plays. Only one example of this first phonograph was made, and that original is now displayed at the Edison National Historic Site in West Orange, New Jersey. The phonograph pictured above is an extremely precise replica, accurate to the smallest details -- including machining marks, extraneous holes, paper shims etc. Though awkward to use, the recording quality is surprisingly good. This first machine had a separate recording diaphragm in front, and a reproducing diaphragm in the rear. Edison quickly discovered that the dual diaphragms were unnecessary and all subsequent tinfoil phonographs used a single recording and reproducing unit. The "Kruesi" replica shown above, formerly in the famous Heitz collection, is believed to have been made in 1928 in conjunction with the (slightly belated) 50th anniversary celebrations of the phonograph. The original phonograph resided in England from 1880 until 1928, when the United States government requested its return just prior to the October 20, 1928 presentation of the Congressional Medal to Thomas Edison for his many achievements. After its repatriation several replicas were made for display in museums and other institutions. 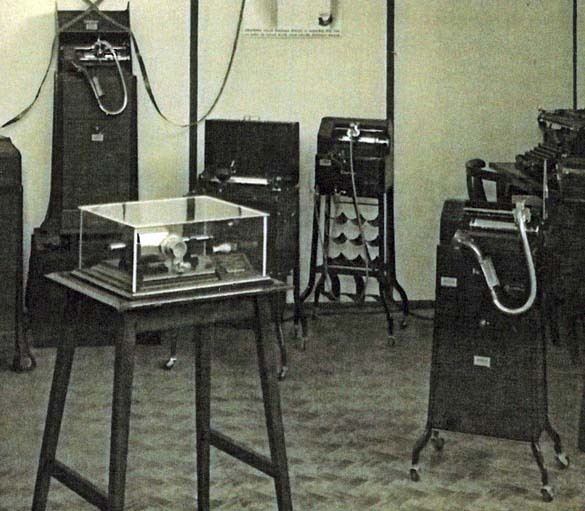 This replica was made by the Edison company, as is documented in the 1930s photograph of an Ediphone dealer's showroom in the photo on the right.. The replica is made almost entirely of wood but is a remarkably accurate copy of the original in all details of size and shape. It is not actually playable but it is evident that a great deal of effort went into making it an extremely precise visual copy for display purposes. 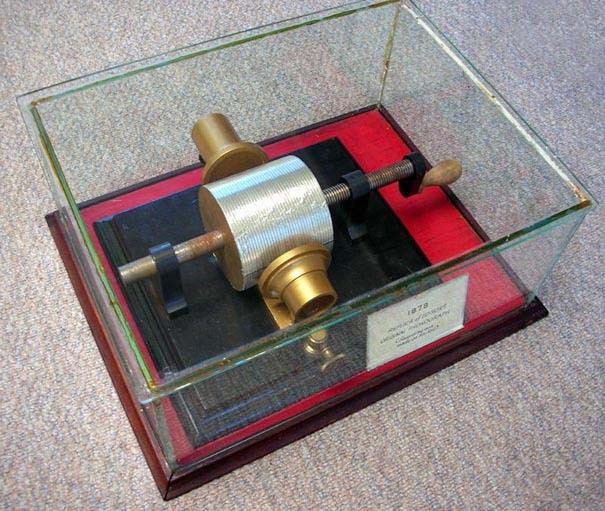 It is one of the earliest replica tinfoil phonographs in existence today. The tinfoil phonographs made in the late 1870s come in a wide variety of sizes and styles, ranging from tiny to huge, simple to elaborate. The most elaborate ever made was the "Drawing Room" phonograph made of hand-filed brass for the Edison Speaking Phonograph Company by Sigmund Bergmann in New York. This was the deluxe version of Bergmann's standard exhibition phonograph, which was made of painted cast iron. The basic cast iron phonograph was mounted to a plain wood box, while the deluxe instrument had a beautifully inlaid rosewood box for supplies. Weighing over 125 pounds and measuring nearly three feet wide and one foot high, this extraordinary phonograph cost $200 in 1878 dollars, a fortune for the time. Only seven brass phonographs were originally made, with just a single example known to have survived (in a museum in Scotland.) This was not only the most elaborate and ornate tinfoil phonograph ever made, it was also the finest. The sound quality surpasses any phonograph made prior to 1888. It was suitable for grand public exhibitions, as well as for use in the "scientist's sanctum," as the instruction manual points out! In 2000 museum curators allowed master machinist Bill Ptacek to disassemble and take detailed measurements and photographs of Bergmann phonograph serial number 172, the only known brass Bergmann. Ptacek crafted three exact duplicates of this machine, with every detail precisely matching the original. It is an exceptional piece of workmanship and is visually stunning. It is also the loudest and clearest of any tinfoil phonograph I have ever heard.